Deji is trying to persuade Amaka, his mistress to become his second wife. We see the adverse effect his extra marital liasions are having on his home in a scene where his wife Funmi pleads with Amaka to leave her husband alone. “You are young and beautiful. You can get any man. For my children’s sake… I am begging.” The wife seems to take her husbands infidelity as a given. It is more something she has to deal with herself, in terms of approaching the other woman rather than approaching him. Almost as a warning she tells Amaka that she has dealt with others before. Perhaps she tells her this because she knows how idealistic young women are. She wants to let Amaka know that her husband is not in love with her, rather that sleeping with numerous other women is just what he does. In this sense she accepts his cheating, but it is only because this woman has stuck around longer than the others that she decides to tackle the issue. Amaka refuses to stop seeing Deji and his wife is willing to do anything within her power to stop the affair. 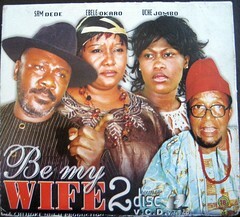 The film turns into a whodunit mystery when Deji winds up dead. Was it is wife who killed him because she could no longer take his cheating ways? Was it his mistress who killed him because she just wanted a way out of the whole situation? Or was it his mistresses long standing jealous boyfriend? How can I tell you who did it if you haven't watched it? LOL That wouldn't be right. The mistress has a boyfriend and the husband is like her sugar daddy but he wants to make her official and for her to stop seeing her boyfriend, but as she and her boyfriend are childhood weethearts she wont leave him alone.